Pearl is an easily accessible home located on a tree lined street. Home is spacious with a lot of sunlight coming through large windows tastefully decorated with white sheers and curtains throughout. 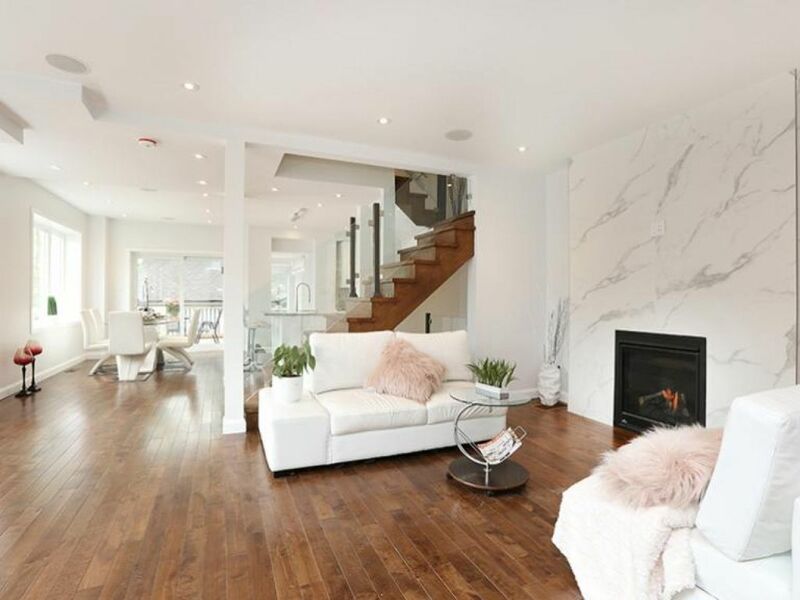 Through a front door into a vestibule Pearl Of Rosedale boasts a large open concept living and dining areas are decorated with modern furnishings. Vestibule has a large closet and a guest bathroom - a two piece powder room. There is a gas fireplace. Overlooking a curtained cedar deck there is a secluded working area with desk/laptop space and large windows decorated with room plants. Kitchen with stone counters, European cabinetry, professional series Electrolux kitchen appliances. Includes, fridge, stove, oven, hood fan, dishwasher, garbage disposal, coffee machine, electric kettle and all the cookware necessary to make a gourmet meal. Walkout through sliding doors onto a cabana-like setting deck with furniture and Napoleon BBQ. Second floor features three bedrooms, two full bathrooms, one of which is a master en-suite with a large walk-in closet. South bedroom is a largest of the three, has a queen size bed and is decorated in white and pale green and grey tones. The next two bedrooms are also decorated in white, blue and pale grey tones and are complete with large windows decorated with silk curtains. There is another queen bed and one single bed. The third floor boasts a bright and airy loft with king bed, a desk and skylights. The loft has a large storage area with hangers. Note that the house has central heating and air conditioning. There is a cross breeze from the skylights on the floor if you wish more fresh air. Basement of the home is decorated in the same tone with electric fireplace and a small couch. There is a single bed with storage drawers as well as a pull out single bed. There is a private full bathroom. Laundry room with front load washer and dryer is located in the basement as well. Guests will have full private use of the house and a front and back yard. Guests can use all parking: four parking spots including a double car garage, patio/BBQ area as well as fully equipped laundry room. Garage remote key for easy access. Fully equipped laundry room is located on the lower level. This reservation has a Super Flexible cancellation policy - refunds will be issued up to 14 day prior to the check in date. A 100% refund is provided for travellers cancelling at least 14 days before check-in. A 50% refund of the rental amount is provided for travellers cancelling from 7 to 13 days before check-in. No refunds are provided for travellers cancelling less than 7 days prior to check-in. Our house rules: no smoking, no parties or events, no pets. CHECK-IN/CHECK- OUT: Check-in any time after 3pm, and check-out is by 11am. 4. BEHAVIOR: No loud noise after 11 am. Residential neighbourhood by-law. 5. NO outdoor SHOES inside the home. 7. DO NOT move furniture. smoke either out front or back). Make sure to discard cigarette buds appropriately. This property was incredible! It checked off all of our boxes, and even the boxes we didn't anticipate. I would definitely recommend this property to others, and I would stay there again next time I'm in the area. This lovely home was perfect!!!! The house was super clean, beautiful furniture, and just perfect for family vacation! I would definitely go back, the host was absolutely great. Nothing about this trip was bad, everything was awesome. She was always available and even contacted me before and after my trip. The house is next to a busy road if your not used to nose but not enough to effect you in any way. Great location and lovely home. I would definitely rent this home again on my next trip to Toronto! Thank you so much for everything! This home is located in a beautiful neighborhood close to transit, parks and grocery stores. Spent a lovely Christmas here with my family. Thanks Darya! It worked for our business trip! The house was large enough for 4 of us to have independent space. On a corner lot, the house is beside a busy street so sometimes traffic noise was an issue. We would have liked blinds or darker curtains to keep the light out in the bedrooms more effectively. House was clean and otherwise well equipped. Great Location, beautifully decorated with an attentive home owner. My family greatly enjoyed our weekend stay. I highly recommend this home for an adult family stay. However, no shoe rule in the house... be careful wearing socks and using the stairs... that can be slippery. Hope to go back in November.